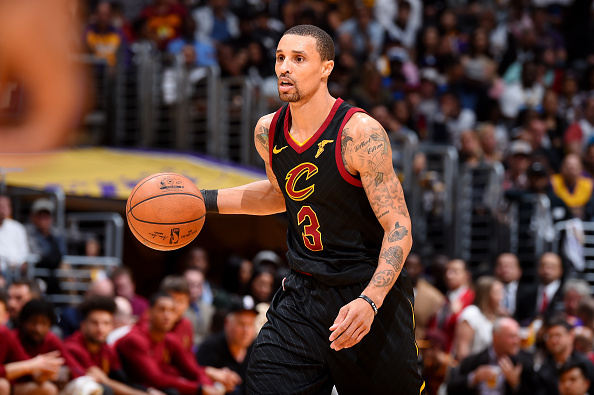 After watching 15 grueling games with Isaiah Thomas at starting point guard, the idea of the Cleveland Cavaliers trading for George Hill was seen as much needed relief. Though older and sometimes prone to injuries, Hill appeared to be a better fit for Cleveland. He wouldn’t hijack the offense as Thomas had been doing, nor did anyone expect him to cause the same level of locker room stress. All in all, the Cavs trading for Hill on the same day they jettisoned Thomas looked as though it’d be a very beneficial move. Almost two months later, not being Isaiah Thomas remains the most notable thing Hill has brought to the table. Beyond this, he’s been wildly inconsistent, and it’s clear Cleveland needs much more from him moving forward. In his defense, Hill has had flashes for the Cavs. There were a couple instances – such as his 26-point effort against the Brooklyn Nets – which indicated he’d be a great addition to the team. The problem, though, is the fact these solid nights are few and far between. In the ten games since his showing against the Nets, he’s only scored double-digit points three times. He’s only topped ten points once. His shooting percentage fluctuates on a nightly basis, going as high as 60%, but also as low as 0%. Looking at the bigger picture, Hill’s PPG, field goal percentage and three-point percentage have all notably dropped since joining the Cavs. While with the Sacramento Kings, he was shooting a career high 45.3% from beyond the arc. With Cleveland, it’s plummeted to 33.3%. One would think playing with someone like LeBron James – who unsurprisingly requires extra attention from opposing defenses – would result in Hill continuing the hot shooting he was displaying with the Kings. Now, sure, we’re talking about just 16 games with the Cavs. Still, Hill seemed like a safe addition to the team, a reliable veteran who could run the offense while providing consistent scoring. Of the four players Cleveland traded for at the deadline, he had the most experience and was therefore someone the team didn’t need to worry about when it came to his adjusting to increased expectations. While he hasn’t shown any issue facilitating, Cleveland isn’t getting enough from him offensively. If you need a glaring example at how unreliable Hill has been so far, look no further than the minutes backup point guard Jose Calderon has been receiving lately. For the month of February, the 36-year-old barely touched the court, averaging just 5.7 minutes per game. In March, said average is up to 18.3, with him seeing significant time in four of the past five games. As a reminder, Calderon is no contending team’s idea of a solution at point guard. Many were surprised Cleveland made him its first signing this summer, getting a contract offer to him within minutes of free agency starting up. This isn’t meant to insult Calderon, who’s played surprisingly well with the Cavs this year. Some of his increase in playing time is also a result of the injuries the team is dealing with. However, Cleveland likely doesn’t find a situation of relying on Calderon for crucial minutes in the postseason ideal. I’d like to think the team would much rather prefer to get consistently solid performances from Hill. Right now, this isn’t happening. There’s obviously still time for Hill to settle down. The Cavs are the third different team he’s played with over the past year, and the only one which has championship expectations. Such a transition is understandably difficult. Still, come playoff time, Cleveland will need Hill to be back on track. Eventually, he has to offer more than his ability to not be Isaiah Thomas, as welcomed as that has been.